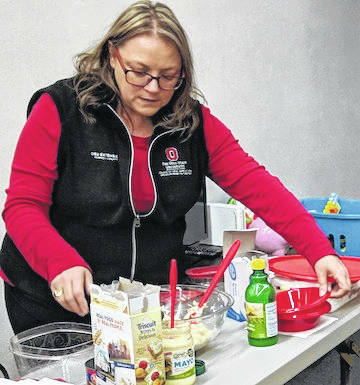 MOUNT GILEAD — Candace Heer, OSU Extension Educator for Family and Consumer Science, cooked up a crock pot of split pea soup for sampling last week at the Morrow County Community Center. Heer’s class and demonstration is part of the nutrition series she is doing for the Community Center’s 90-Day Fall Fitness Challenge. Community Center member Christy Tolle said she will try the recipe that Heer shared. The nutrition classes are open to all as well as Community Center members. Other Fall classes at the Community Center this fall are Live Fit with Cait, Prime Fit with Stephanie and Exercise to energize with Allen. Silver Sneakers classes are at Seniors on Center and Senior Exercise at Candlewood. For times and places, call the Morrow County Community Center at 419-947-2100 or stop in at the gym. The Morrow County Community Center Gym is at 16 S. Main St., Mount Gilead.